Sep 25 • Cars • 795 Views • Comments Off on Is Shipping My Car The Right Choice? If you’re facing an impending move, you probably have a lot on your mind. You’re thinking about how you’re going to get everything packed and shipped to your new home. Perhaps you’re also helping kids or other family members pack up their possessions. Whatever the reason for your move, there’s no doubt that the process of getting yourself and everything you own from one location to another can be time consuming and stressful. You’re already worried, and you haven’t even thought about how you’re going to get your personal vehicle to your new home. For many individuals, getting a vehicle to a new location is as simple as hopping in and driving from one place to another. Unfortunately, moving a vehicle isn’t always so easy. You might own a collector car that you can’t risk driving on busy highways or the weather might get in the way of you making the drive on your own. When moving a vehicle becomes a problem, many individuals turn to shipping companies who can easily transport a car, small truck or motorcycle from one area to another. Consumers can get free quotes from transportation companies on sites such as UShip.com, which can take some of the stress out of moving your vehicle. 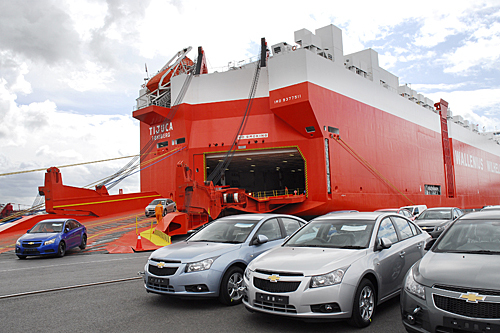 Of course, deciding whether or not to ship your car isn’t always easy. You’ll need to weigh a number of factors before you can decide if you should ship or drive your vehicle to your new home. It’s best to think through these questions well in advance of your move so that you have plenty of time to make arrangements for your car to be shipped if you choose to go that route. Before you make any decisions, though, ask yourself these questions. Can I Drive to My New Home? If you’re moving a short distance, consider driving your car yourself. This will save you on shipping fees and may be faster than having your car transported. Remember to consider your familiarity with the terrain where you’re moving, your car’s condition and anticipated weather conditions when deciding if you can make the drive. Do I need to Move more than One Vehicle? If you own more than one vehicle, you may need to drive one and ship the others. If you’re moving a long distance, you may even need to have more than one vehicle shipped to a new location. Be sure to clarify this with your carrier so that all of your vehicles can be transported at the same time if possible. Is My Car Classic or Collectible? Those individuals own classic or collectible cars tend to prefer shipping over driving. Having your classic vehicle shipped is a great way to ensure that it will make the journey from your old home to your new one without incurring any damage. Work with a specialty transport company if you need to ship more than one collector car. Do I need to use My Car to Pack Items? Using your car to pack up your closet might sound like a great idea. However, you won’t be able to pack items in your car if you’re having it shipped. If you only have one or two carloads of items to move to your new place, consider driving. Otherwise, opt for having your vehicle shipped.